← Camp’s going to run. There, I said it. I’m a big proponent of public transportation, and I think there should be more. That being said, I love that Lincoln has a bus system, but I’ve always had problems with the fact that all routes LEAD TO DOWNTOWN!!!! Believe me, I used to ride when I had a job down there (now I don’t). Not that I’m anti-downtown, but it just seems incredibly inefficient to have all routes going there. In larger cities you have to deal with transfers, and yes they may be a pain, but as a taxpayer, I really think it’s unnecessary for all routes to end up at 10th & O. If this report is valid, it doesn’t surprise me. 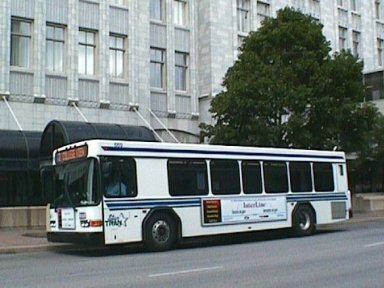 Lincoln’s bus system is still operating on the premise that everyone NEEDS to go downtown, to jobs, shopping, etc., and that is not the case anymore. We’re bigger, we have places to go to work, shop, etc., other than downtown, and most of us don’t really have the time to take a one hour side trip, to or from work. If they can’t figure that out, than I don’t believe they can figure out their finances, either. It kinda, sorta, ticks me off that the city of Lincoln is condescending and thinks that the bus service ONLY provides to people who don’t have cars, whatever the situation, and not the entire population of Lincoln! I would be glad to ride, but their routes just don’t fit into my schedule……I’m not trying to be mean, I’m just really trying to be green! There have been all sorts of transit studies done over the past ten years looking at updating the system. They did change the network from the old fashioned – all transfers downtown – system, from the days when downtown was the center of commerce, shopping etc. The new network connected downtown to Westfield and there was a neighborhood connection that went north and south from Westfield to finish the loop. My understanding is that the two connector routes (crucial to that network) were cut by the powers-that-be in this year’s budget. The interesting part about transit vs cars is that the old trolley tracks used to run south down to Sheridan, east on Randoph to 48th and all the way north to Havelock. Rumor has it some of those rowdy methodists in dry University Place would topple the cars off the tracks so people couldn’t get to the taverns in Havelock. Deena – you might need to refudiate that.